Have you just been moving and grooving and rocking and rolling in your business, but now you’re stuck? I get it! I came up with 7 habits that will help you get unstuck! Part of my job is to help coach individuals and empower them to get out of their self-imposed comfort zones and start living a life they could have never imagined. I love to ignite a passion and a fire in people who are ready for a change. So many times we can be so focused on our goal – which is not a bad thing – but we will forget the little habits that are necessary to continue that momentum. We miss the little steps and the little joys along the way, and we become complacent and exhausted. There’s a saying that goes, “The journey of a thousand miles begins with one step.” So, let’s take that first step together! These are 7 fundamental steps that will get you moving and grooving again. 1. First, I believe it is super important for you to designate a time of the day to get quiet. You can do it in the morning, at night, whenever…but set aside a time to get quiet. I’m a morning person, so I like to do it first thing after I get my coffee in the morning. Here’s what I do. I get quiet and I say thank you. I believe that gratitude is a base that we should all be coming from. I say thank you for the things that are happening in my life, and thank you for the doors that have been opened. I also say, I’m sorry. I take the time to ask for a change to happen in me. Give me more patience, or more understanding. I think, fundamentally, quiet time is something you must get back to in order to move forward. 2. Honor your body. We only get 1 body. We cannot turn this body in for another one! Let me ask you – are you nourishing yourself? Are you drinking enough water? Are you getting enough sleep? Are you taking your vitamins? Are you getting enough exercise? If you forget yourself, you will regret it. You must create the habit of honoring your body. 3. I think it’s very important to take the time to disconnect and breathe. We can become so focused on our goals, our business, that we seem to be juggling plates, and we really need to make a habit of getting up and walking away. It refreshes your brain and refocuses you. Even if it’s just a quick walk to the elevator or outside to get fresh air. Just getting away to refocus is an extremely important habit if you feel stuck. 4. Next, do what you love. Something where there’s no competition involved. You’re not trying for that promotion. You’re not trying for that raise. Do you have a hobby that you love? Mine is to read…I love reading! I have a son who loves to play the guitar. My neighbor runs every day. Whatever it may be, just find a hobby that you love. It’s a fundamental habit that you should get into to center yourself again. 5. I believe you should journal your ideas. If you are like me, I have ideas that are constantly going through my mind. If I’m not careful, I will always want to chase that next shiny object, but it may not be my time. Write what you want to do next instead. Just know it might not be the right time. 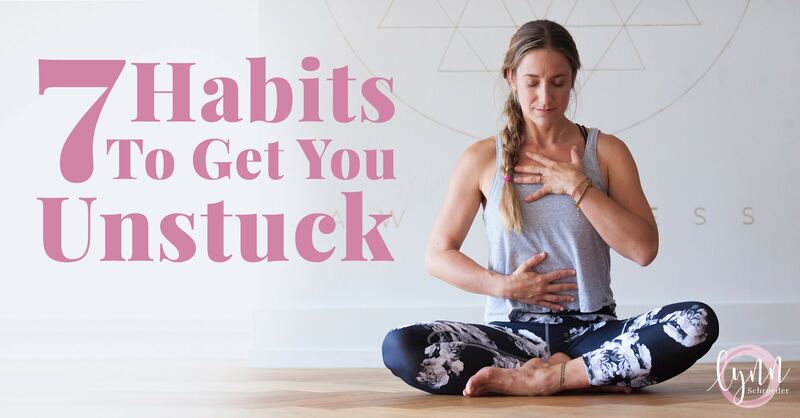 I promise you it’s a habit that will help you get unstuck. 6. Personal growth. Learning and growth are really your currency, and we should get rich off of them. They’re right in front of us like a pot of gold. Do you agree? Do you take the time for personal growth? Do you read books, listen to podcasts, seek coaching? It’s so important, and it will help you get unstuck! Invest in yourself. 7. The last habit is to get back to your center. Get back to who you are. Stop trying to emulate everybody in your company that is successful. It’s definitely not a bad thing to follow the leaders, but so many times we try to take their identity without even realizing it. Have you ever done that? If you start to morph into your leader, then you also start to lose yourself. We must get back to our center. Own who we are. Be our transparent, authentic selves. Can you relate to any of these habits? Leave a comment for me. I believe in paying it forward and sharing advice that has helped you with others. And also, if you are a woman and you feel that you are not confident enough or not feeling worthy enough, and you need a little boost in your confidence, I have something I’d love to gift you with. I have something called my 7 Days of Affirmations. One affirmation a day will come to your email. It’s just my voice on your email validating you. Affirming how awesome you are. If you’re interested, just click here! Loved these 7 habits! It is very easy to get “stuck” in life. I agree. That’s why it’s so important to be sensitive to what’s going on in our life. To recognize when we need to stop, wait, or change directions. Hope you and your family are doing well, Stacie!